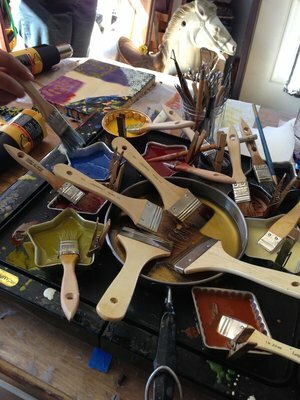 Have you ever been curious about painting with molten beeswax? 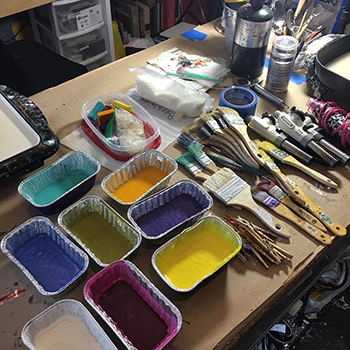 you already have with encaustic? 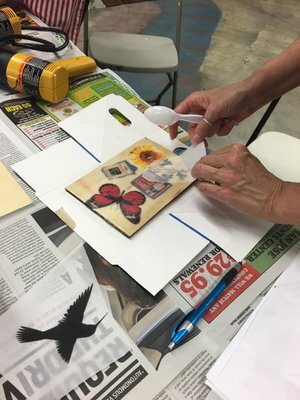 Would you like to learn my signature image transfer techniques? I recently began teaching 1 and 2 person private workshops in my studio. I am really excited to be able to start teaching again and wold love for you to join me. Check out my WORKSHOPS page to get all of the details. I am thrilled to share that I created 10 brand new mini encaustic paintings exclusively for the 2018 UGallery.com Ornamental Artworks Collection. Each 4x4 painting comes gift-wrapped and includes a petite easel for display. They are only $75 each and includes free shipping! Visit www.ugallery.com/artist/Shannon-Amidon to claim yours before they all fly away. San Francisco Open Studios was fantastic! I flew down from Portland for a few days to participate in SFOS at Secession Art and Design. The weekend was so great and lots of paintings found new homes. One of my favorite parts of being an artist is meeting and talking with the people who like and connect with my artwork. If you didn’t get a chance to come out the artwork will be on display until Nov. 24th!